Cooking your own food is good for your mind and body, and so are the ingredients that go into your food. We often forget that food is first and foremost fuel for our body: our muscles, organs and cells. For thousands of years, the citizens of India have practiced what is known as ayurvedic medicine, or healing with food. Doctors are only now discovering the real power of what we put into our bodies. To better nourish your body and prevent disease, here are 20 Indian ingredients that will enhance any dish and enhance your life. Turmeric has received a lot of attention recently due to research that suggests it can boost brain function and help in preventing degenerative diseases such as Alzheimer’s disease. It’s also high in antioxidants and anti-inflammatory. Ginger also has a reputation for healing. It is used as a natural diuretic, helps to relieve pain and nausea, helps lower cholesterol, and can inhibit the growth of cancer cells. Chilis are anti-inflammatory, antioxidant, help ease pain associated with arthritis, and can help prevent clotting associated with stroke and heart disease. Cumin is a savory herb used in a lot of meat and bean dishes. Cumin aids digestion, improves immunity, helps relieve constipation, has antifungal and antimicrobial properties, suppresses coughs due to the common cold, and is rich in iron, which is especially good for anemics. Coriander, which is often used with cumin, adds texture to sauces and has a hint of citrus in its flavor. It is great for cooling skin inflammation and skin disorders, helps lower cholesterol and blood pressure, contains antifungal properties, aids in digestion, relieves diarrhea, and is rich in iron as well. As the main ingredient in hummus, the chickpea or garbanzo bean has recently gained a lot of popularity in the West. Chickpeas are common in Indian dishes and are high in nutrients, including calcium, phosphorus, potassium, magnesium, iron and selenium. Medicinally, the chickpea helps in preventing digestive disorders, iron deficiency, diabetes and coronary heart disease. It also eases constipation, stabilizes blood sugar and lowers cholesterol. Beans are a staple in Indian cuisine and another one that is commonly found in Indian dishes is the mung bean. Mung beans are packed full of nutrients such as magnesium, manganese, potassium, copper, zinc and B vitamins. Mung beans can defend against age-related illnesses such as heart disease, cancer, diabetes and obesity. Lentils have been harvested for thousands of years. They are small, quick to cook, and are great for Indian soups. They are good for heart health, diabetes, muscle generation, digestion and brain function. Their high potassium content makes them a good source of electrolytes. As in many other cultures, garlic is often used to flavor Indian dishes. Garlic’s medicinal uses include lowering blood pressure and cholesterol, treating fungal infections and killing food-borne bacteria. Curry is one of the most popular spices used in Indian cooking as it is used in many renown savory sauces. Curry is anti-inflammatory, antioxidant, antibacterial, antifungal, stabilizes blood sugar, stops diarrhea, lowers cholesterol, and even helps to protect the body from radiation and chemotherapy. It is high in vitamins A, B, C and E, as well as calcium, iron, magnesium, phosphorous and copper. Cardamom is a versatile seedpod that whether whole or ground can be used in a variety of sweet and savory dishes. It is anti-inflammatory and antioxidant-rich, is great for colds and digestion, improves bad breath, lowers blood pressure, improves depression, kills bacteria and prevents blood clots. Mustard seeds are normally toasted in a pan with oil, added to a curry or used in pickled dishes. They are high in selenium, omega-3 fatty acids, phosphorus, manganese, magnesium, vitamin B1 and copper. Mustard seeds are anti-inflammatory, lower high blood pressure, reduce the severity of asthma, reduce the frequency of migraine headaches, restore sleep patterns in women with menopause, and prevent heart attacks in patients with diabetic heart disease and atherosclerosis. Coconut milk is often used in sweet curries and is very rich in nutrients. It is rich in B vitamins and vitamins C and E. It is also mineral-rich in selenium, iron, calcium, magnesium and phosphorous. It is antibacterial and antiviral, which means it can help fight infection. Fenugreek is a tasty herb that has been used in Eastern medicine for centuries. It boosts energy, metabolism, stabilizes blood sugar, and is used to treat a variety of illnesses. It fights inflammation, diabetes, high blood pressure, gastritis, bad cholesterol, constipation and upset stomach. Onions are high in vitamins A, B6, C and E, and minerals such as potassium, iron, and folic acid. Onions are also high in flavonoids, antioxidants and phytonutrients. Onions can lower your risk of having a heart attack, lower blood pressure, prevent plaque buildup, prevent the onset of hypertension, reduce the risk of stroke, boost your immune system, and are anti-inflammatory. Fennel is an antiflatulent and good for digestion, constipation and diarrhea. It also eliminates bad breath. Fennel can reduce high blood pressure, improve brain function, protect eyesight, treat anemia, strengthen your immune system, and reduce the risk of breast and liver cancer. It is high in vitamins A and C, folate, niacin, potassium, phosphorous, iron, calcium, manganese and magnesium. Ghee is simply clarified butter, which is butter that has the milk solids removed through heating and straining. Because it is clarified, it has a higher smoke point than both butter and olive oil, making it handy for pan-fried meals. Ghee is high in butyrate, which improves the digestive system, boosts your immune system, and decreases inflammation. Unlike most dairy products, it is low in the animal protein casein, which has been linked to cancer. It is also rich in vitamin A, D, E and K.
Yogurt is another dairy-based product used often in Indian dishes. Yogurt is full of probiotics that help support digestion and maintain balance in your intestinal flora. It also boosts your immune function and promotes good bacteria. Yogurt is high in vitamins B2 and B12, D, calcium, potassium and magnesium. In Ayurvedic medicine, cloves are used as an oral treatment for bad breath and tooth decay. Cloves help promote better digestion, kill bacteria, help to control diabetes, preserve bone density, protect your liver, boost the immune system, and shield against the effects of chemotherapy. Anise is a sweet, liquorice-tasting herb that resembles a star, hence its name. Star anise contains shikimic acid, a plant-based precursor to oseltamivir, which is the active ingredient in the antiviral medication Tamiflu. Star anise is also antibacterial, antioxidant, antifungal and can fight against yeast and inflammatory problems due to candida. As you can see, many ingredients used in Indian cuisine can treat a wide variety of common ailments. Indian food is renown for its variety of herbal ingredients, intoxicating aroma and intense flavors. 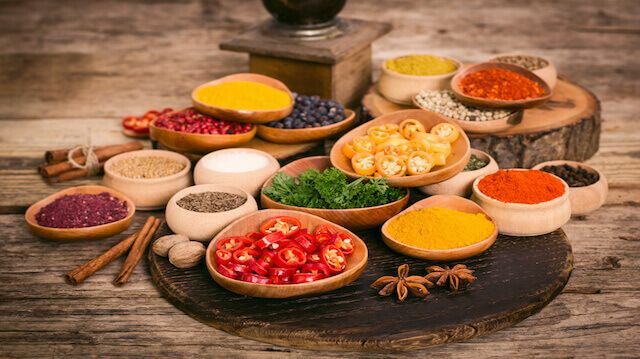 Incorporating more Indian spices and whole foods into your diet can help you remain healthy and nutritionally balanced. What a deliciously painless way to prevent illness! What are some of your favorite Indian dishes? Let us know in the comments section below. Hey Buddy!, I found this information for you: "20 Indian Cuisine Ingredients That Heal from Within". Here is the website link: https://www.thealternativedaily.com/indian-cuisine-ingredients-healing/. Thank you.